Sleeping was not so easy until midnight, as there was quite a racket going on with people drinking and chatting right outside our window and others watching TV at full volume underneath our room, so we decided to have a bit of a lie-in in the morning. After breakfast we had another chat with James and his clients, who told us, out of James’ earshot, that they also wanted to have a Landcruiser for their next safari! We then went shopping and treated ourselves to two comfy camping chairs. Afterwards we drove to Dagoretti for lunch with Victoria, Charles’ wife. One of Charles’ sons arrived a bit later and joined us for a filling meal of banana and potato mash with spinach. We teased out of Victoria the revelation that Charles never cooks for her when he is at home, so we made him promise to do so sometime soon, perhaps for Victoria’s birthday. Originally we had planned to go to Kazuri beads, but we needed a rest and opted for a siesta instead. We took the opportunity to check our emails and downloaded our pictures, of which we already had approximately 2,500! Unfortunately, we discovered that we can’t open the RAW files from our new D7000 camera in our version of Photoshop, which is a bit of a pain! We either need to upgrade to the latest version of Photoshop or get another programme that converts the RAW files first. Well, that has to wait until later. At 19:00 Tal and her boyfriend Gus met us at Karen Camp, where we had a drink and caught up on things before heading to a Japanese restaurant for a meal with Tal’s parents and a friend of the family. Tal’s dad is Dutch and her mum is from Israel. We had an interesting evening with lots of sushi and laughter. We discovered that “Tal” actually means “morning dew”, or “Rocio” in Spanish – what a coincidence! After a big breakfast at Karen Camp, we set off to refuel and meet Charles at Karen junction, as he had spent the night at home in Dagoretti. We set off from Karen just before 9:00 and headed through Westlands. All the way from there until getting out of Nairobi the traffic was absolutely horrific. It took us several hours to get out of the city and then there was a section where the Chinese were building a new road, where we had to repeatedly get off the road and rejoin it a bit further on. Why do they build their roads in unconnected bits and pieces that only seem to join up at the very end of all the construction work? Things got better after we passed Thika, where we thought we even saw a famous flame tree, but every little village has at least one set of speed bumps at each end of the village, and usually even more in between. So the going continued to be rather slower than expected. We ended up having lunch at the Countryside View Hotel just outside of Embu. We didn’t manage to catch even one glimpse of Mount Kenya, as it was hidden in dense cloud all day. The drive continued to drag on and once we left Meru there was only one signpost right towards the end that pointed us in to the direction of the National Park. Maybe that’s why so few people go there? They probably all get lost along the way… It was 17:00 when we eventually arrived at the Murera entrance gate. Manning the gate there was a capable young trainee and a KWS ranger, who was hopelessly disorganised and kept getting our bill wrong. Adding up the rates for two foreigners in US dollars, the camping and car in Kenyan shillings and then a different rate for Charles, who is a Kenyan citizen, was just a bit too much for him! It took more than 20 minutes to sort things out and we got a bit impatient, as we still had a long drive to the campsite. 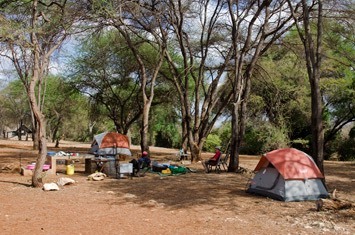 The rates were pretty expensive: 60 US dollars per person per day plus 15 US dollars per person per day for the camping. And the ranger couldn’t even give us change, so we left with a little note saying that KWS still owned us 5 US dollars and some Kenyan shillings. 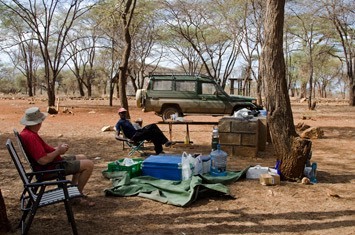 As it was already quite late, we headed straight to the Bwatherongi public campsite, located near the Kinna headquarters. 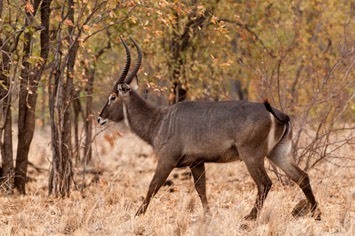 The park was alarmingly dry, but nevertheless we saw a lot of animals just driving through to the campsite: buffalo, warthog, ostrich, Grant’s gazelle, common zebra, possibly oryx and eland plus many, many waterbuck, lesser kudu and reticulated giraffe. 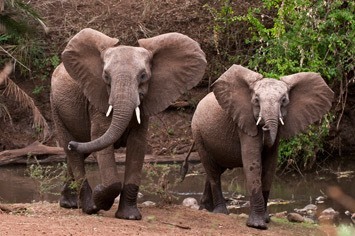 We also saw two bull elephants with great tusks and later came across an elephant family blocking our track. 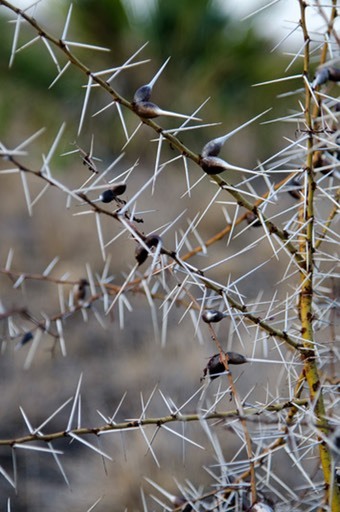 As it was very bushy, with evil-looking thorns on the leafless dry bush, we couldn’t easily deviate and we didn’t really have the time to wait for them to move, as nightfall was fast approaching. We moved up on them slowly, hoping that they would leave the track which at last they reluctantly did with lots of ear flapping. Right behind them was another group of four elephants, so we suddenly found ourselves surrounded by them, which was a little nerve-wracking as we didn’t know how these elephants would behave. 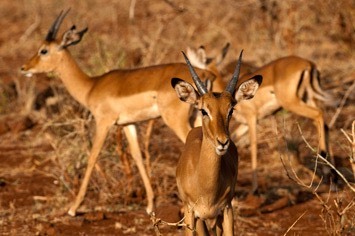 Fortunately, they didn’t give us any trouble and we drove on into the campsite to be welcomed by a herd of impala. The campsite was empty, except for a caretaker and his wife who live in a little wooden house there. There was a big building with proper toilets and showers (cold water only). 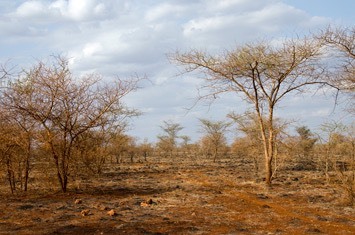 The campsite itself is spacious, but was littered with huge acacia thorns, which we tried to clear away before setting up tent. One of them came right through the ground sheet of the tent anyway! We enjoyed a hearty meal of spaghetti Bolognese with carrots and felt very pleased to have arrived at a place to stay for several days. 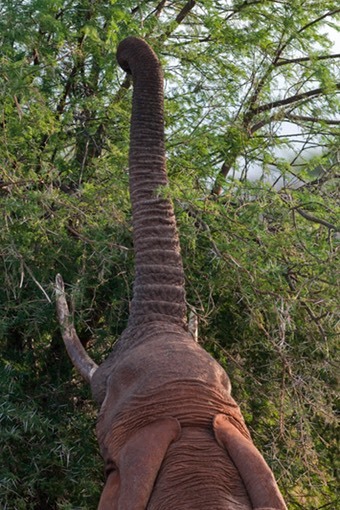 Soon after going to sleep we were awoken by the trumpeting and crunching of an elephant nearby! That was quite exciting! In the morning we could hear two lions roaring nearby, and, after we got up for breakfast, one of them must have been in the little riverbed right next to our camp. His roars were very loud and it was a bit scary as it was still pitch dark. Lucky for us he wasn’t there after breakfast. We set off at first light, but couldn’t find any trace of the lions we had heard. Instead we saw a hippo crossing the road and running away through the extremely dry bush country. What a strange sight! We drove along some rivers and then out into the plains. This area of Meru was practically all red dust and it didn’t take long until the car (inside and out!) took on the same colour. 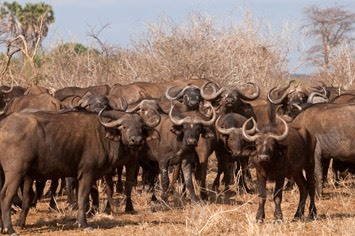 We headed towards the famous Elsa’s Kopje, where we encountered hundreds and hundreds of buffalo. 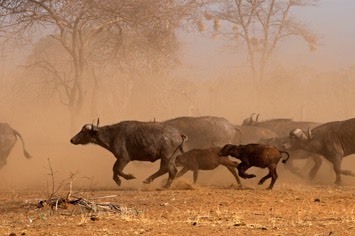 They were very skittish and we stopped to watch a huge, dusty stampede. 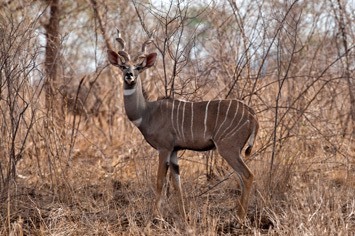 Other animals we saw were lesser kudu, waterbuck, impala, gerenuk, hartebeest, Grant’s gazelle, giraffe and common zebra. We ended up in the rhino sanctuary, a large fenced area, and couldn’t find a way out of it again! 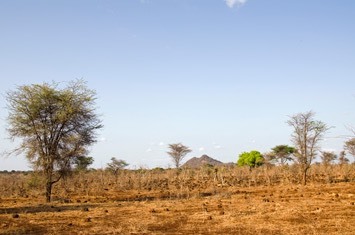 We thought we would have to stay there forever with all the rhinos we couldn’t see! It was a great relief when at last we came to a break in the fence and got out again! 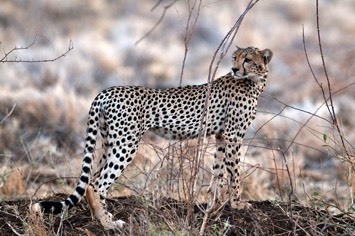 There weren’t many other safari cars in the park, but one driver we met told us that they had seen two cheetahs. 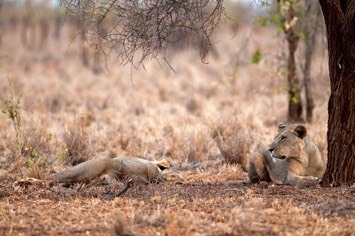 Apparently the area around our camp is very good for lions. 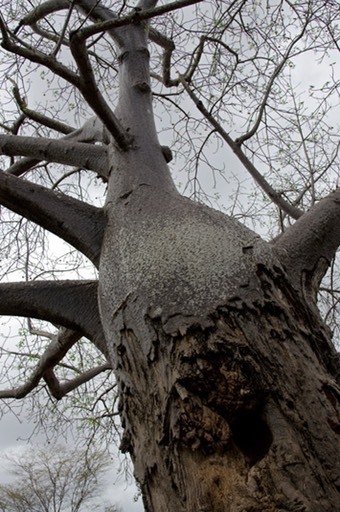 We saw lots of signs of elephants: foot prints, poo, broken trees, but not a single elephant itself. In the afternoon we headed off in a southwesterly direction. 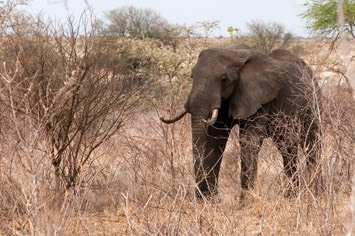 We came across two groups of elephant, both trying to hide in the bushes. They appeared quite thin and were accompanied by a listless-looking calf. 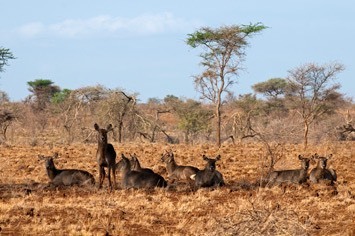 Life must be pretty hard for them at the moment, as there is hardly anything green to be seen in the entire park. The further we drove, the drier and redder the landscape turned. 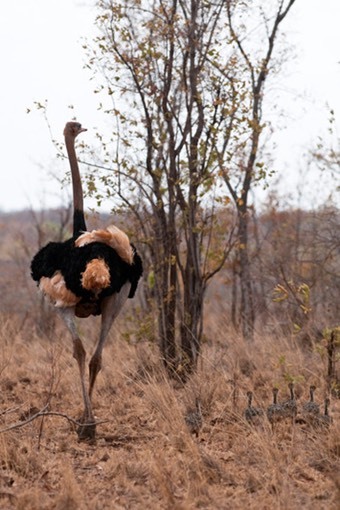 Everything appeared to be nearly dead and from then on we didn’t see very much other then the occasional giraffe, gerenuk, impala, dik-dik and plenty of hornbills. 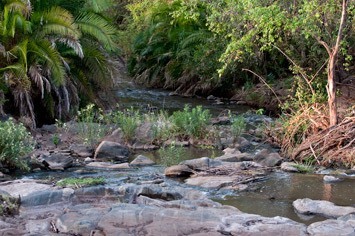 There are several permanent little streams running through the park, each with a narrow corridor of green vegetation only a couple of metres wide. 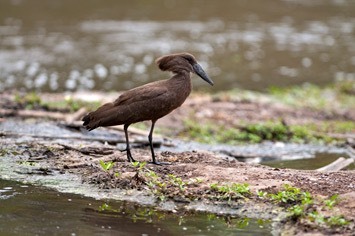 The water attracts many birds including hamerkops and sand grouse. 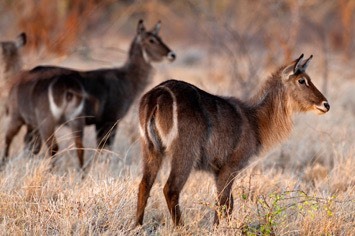 When we returned to the camp we found impala, lesser kudu, baboons and vervet monkeys roaming about. We were given the news that the guy at the entrance had got his calculations wrong (surprise, surprise! ), and he had sent somebody to tell Charles that we owed them some money (more than the 5 US dollars that they owed us!). We decided to sort it all out when we left, unless somebody came to see us. 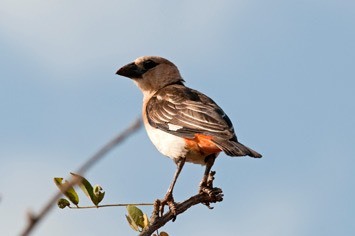 As we settled down in our camp for the evening, we watched a large bat whizzing around the trees over our heads, always returning to perch upside down in the same spot in a tree above us. 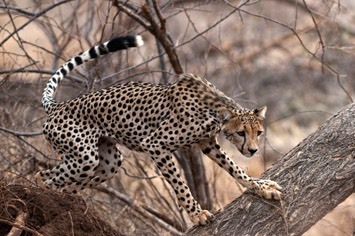 We decided to drive down to the Tana River today, but, while driving along, a cheetah suddenly ran away from the track. When we stopped, we saw that there were two more. 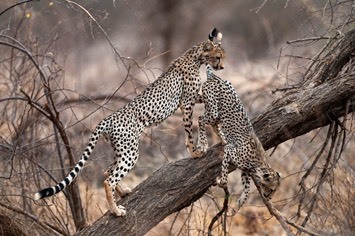 It turned out to be a cheetah mum and her two nearly fully-grown cubs, one male and one female. 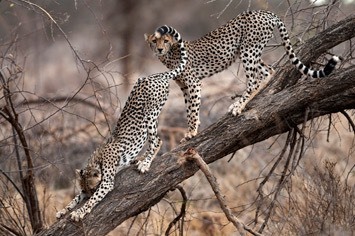 They stayed close to the track while heading towards some waterbuck, but it appeared as though the cubs were rather bored by the need to concentrate on a hunt and having to stay still so as not to give their position away. 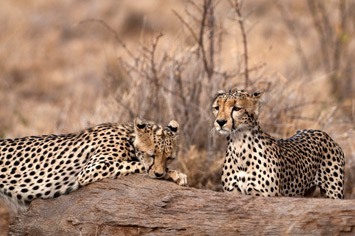 The youngsters were obviously much more interested in play, with games that included the young male sneaking up on these dumb tourists in their car, hiding behind the tiniest tufts of grass. His piercing eyes were stunning, and it felt as though sticking one’s head out of the roof hatch was maybe not the safest thing to do at this time! 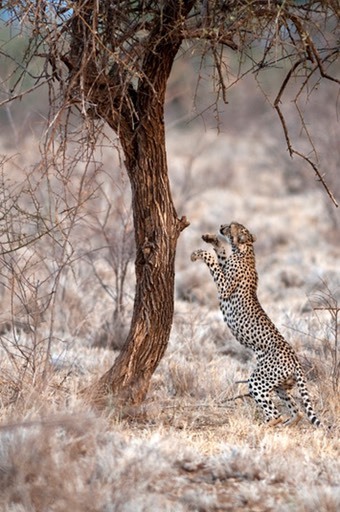 But the cheetah flinched first, only to run away a short distance and climb up a tree! 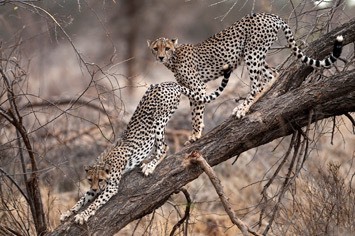 As that wasn’t terribly comfortable, he quickly came down again and started clambering on a fallen tree trunk together with his sister. It was great fun for us to watch, as they were very entertaining, pretty close to the track and we didn’t have to share this experience with any other tourist vehicles! 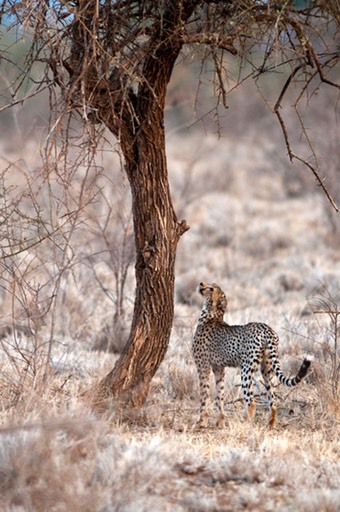 Mum however must have been a bit exasperated, as the behaviour of her kids didn’t exactly help her catch breakfast. 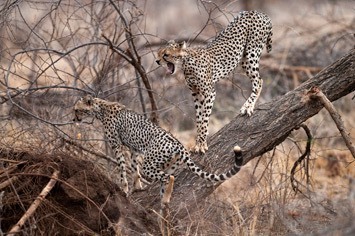 We stayed with them for a wonderful 90 minutes full of cheetah action until they headed off into some thickets near one of the little streams. What a magical start to the day! From then on we drove at “top speed” (40 kph) down to the Tana River. 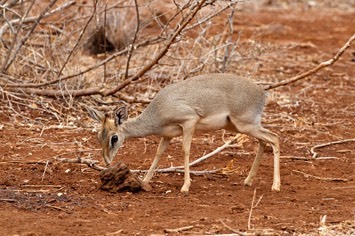 We didn’t see very much along the way except for two jackals, some dik-diks and lots of lion footprints. We emerged at the Adamson’s Falls Bridge, which we crossed. Kora National Park starts on the other side and, as we didn’t want to enter it, we turned around straight away. The ranger at the gate didn’t seem to be too pleased to see us, but he came down to open the gate so we could turn the car more easily. Near the bridge we saw some hyrax and a different monkey species, of which Maren only caught a very brief glimpse, but which looked a bit like a putty-nosed monkey. After admiring the river we decided to drive along the riverbank, which was marked as a good track on the map, but it quickly became more and more difficult, as cut down thorny acacia branches blocked the way all along. 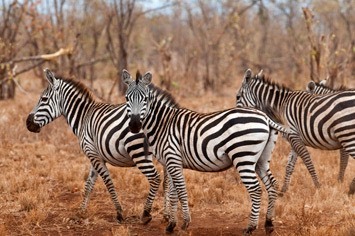 Soon we figured out why, when we came across several herds of goats, donkeys and cows. Most of the herders hid in the bush, including a little boy who left his goats on the track, so that we ended up driving them ahead of us for quite some time before scattering them in the bushes! 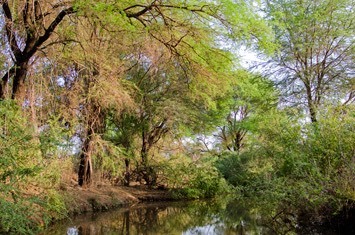 These people had obviously cut down the last remaining green acacias near the river in order to feed their animals. As the track was impassable in places and it felt a bit odd with these Somali people hiding in the bush, we decided to head back and return the way we had come. All in all, we saw about five or six large herds of goats and there were probably plenty more around. Was that why the ranger at Kora had behaved so strangely? Was he aware of what was happening? And, given the number of cut down trees, it must have been going on for some time already. 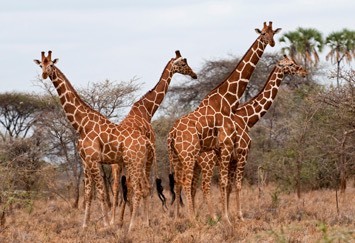 Officially, it is strictly forbidden to drive any domesticated animals into National Parks, and, given the number of goats these people had, one cannot exactly say that they were starving and one should turn a blind eye. But that seemed to be what was happening. 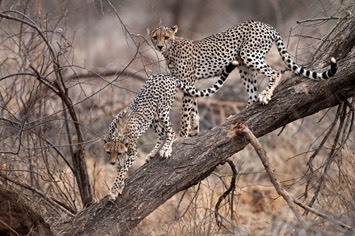 The consequence was that we hardly saw any wild animals anywhere near the Tana River. On route between the camp and the Tana River we also the odd dead goat, cows and even a camel, as well as several living camels browsing in the bush. We thought about reporting it, but as we didn’t know if the rangers weren’t perhaps involved in all this, we decided not to say anything until we left, in order not to get ourselves into trouble. 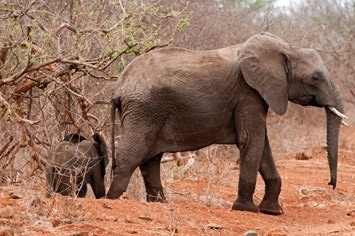 On the way back to camp we came across several ground squirrels and a small family of elephants. 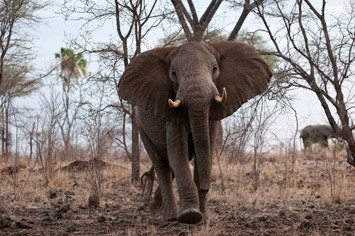 Back at camp, Charles told us that five big bull elephants had visited the camp and walked right past our tent to the little stream! He was so afraid of them that he hid in the tent the moment they appeared! 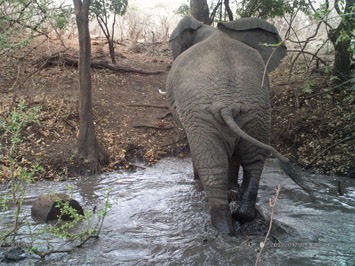 Checking our camera trap which we had positioned next to the little stream, we found it had taken some really nice photos of these elephants drinking and crossing the stream! It was certainly proof of Charles’ story! 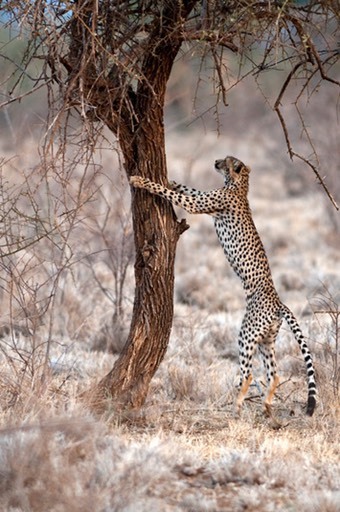 In the afternoon we went to Leopard’s Rock in yet another futile search for the elusive leopard. 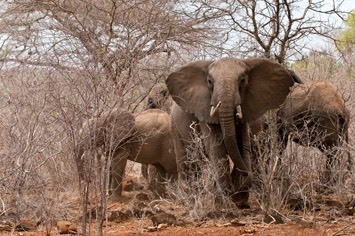 But we came across several groups of elephants, which only seem to occur in very small groups here in the park, possibly to avoid competition for the little food that is available? Later a driver told us about two lions near Elsa’s Kopje, so we went to check them out and eventually found two young males. They were resting under a small tree quite a way away from the track. 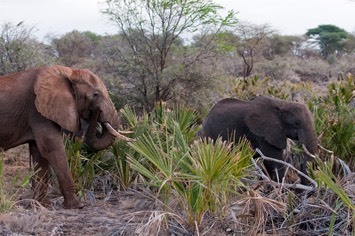 One more elephant family rounded the day off, and, while sitting in camp waiting for dinner, we could hear some animal snort in the darkness. Who knows what the night may bring? 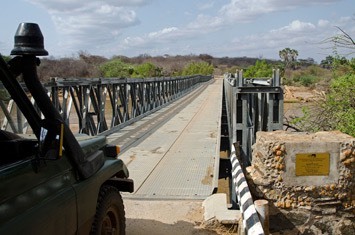 We decided to head back towards the Tana River today, but this time further west than the route we followed on the day before. We drove past where we had seen the cheetahs (but no sign of them today), and along a nice stretch of the river, but we hardly saw any animals. 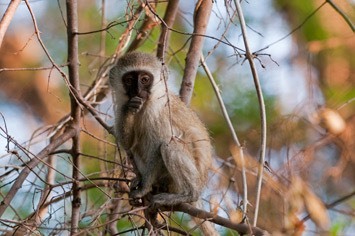 When we got the area just east of Elsa’s Kopje, we suddenly saw a man wearing a long white coat walking in the bushes. He froze when he saw us and we took his position from the GPS. 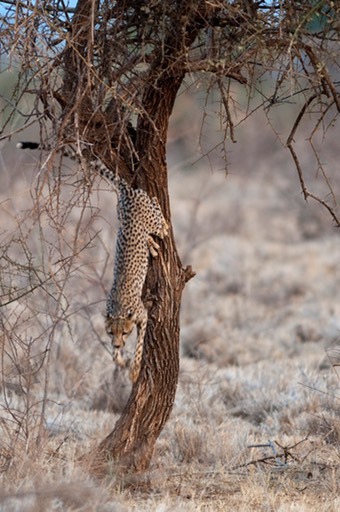 Mick was convinced that he was a poacher carrying a gun under his long coat, because why else wear one in the heat of Meru? A little further down the track we saw more human footprints and then several old fireplaces. The area didn’t feel particularly safe after our encounter, so we decided to head back and inform the rangers at the headquarter. We didn’t have to go that far, as we bumped into a ranger’s car just the other side of the kopje. We told them about the man, and gave them the position and they were straight on the radio to call the information in. 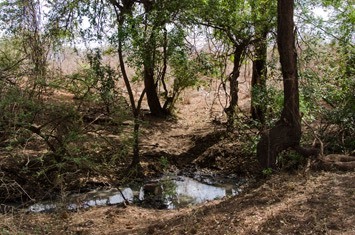 The fireplaces we had seen were apparently from their anti-poaching team that was scouring the area. We also told them about the many goats we had seen, but they didn’t seem to be terribly concerned about them. 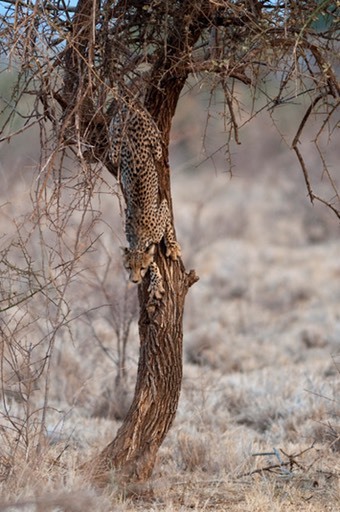 At least they went to check out the presumed poacher straight away, so hopefully they will catch the guy. 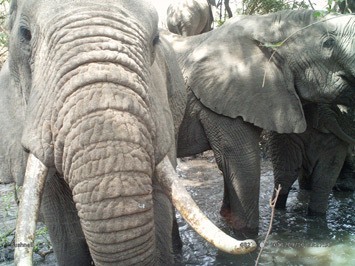 Having poachers wandering around in Meru explains why most of the elephants we encountered were extremely nervous and quick to threaten any humans approaching them. We continued along another lovely stretch of a river, but, despite staring at every single tree, we failed to spot a leopard. It was turning into our jinx species again! All in all it was a rather game-less game drive, except for some very scared elephants earlier on, a few hippos and some of the “usual suspects”. 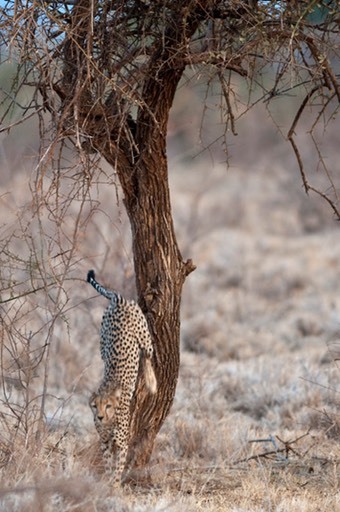 However, this game drive left us with a somewhat bad feeling about Meru. After lunch, a siesta and some laundry, we downloaded some 850 photos we had taken in the last few days. At 16:30 we headed out again. 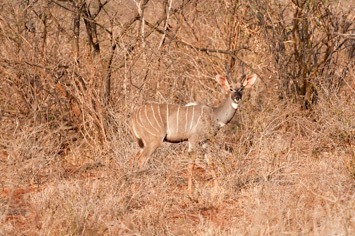 We approached a group of lesser kudu to take some more photos of them, but they started running away. 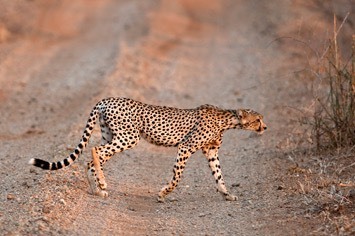 Suddenly, in a cloud of dust, a cheetah shot past the car in hot pursuit! 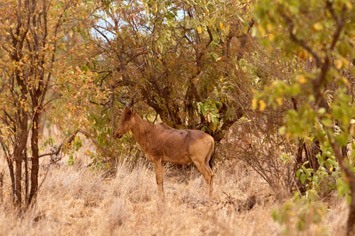 It crossed ahead of the car, ran past the right side of it and then caught a female kudu behind the car. 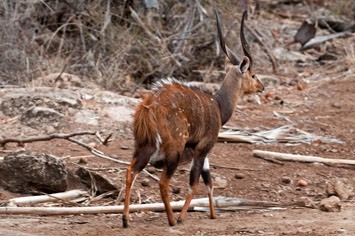 Mick saw it jump on the kudu’s hindquarters and bring it down in a big cloud of dust. 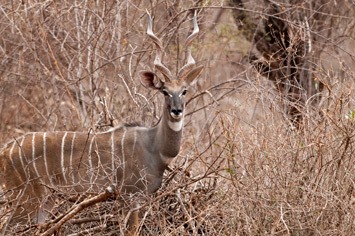 We could hear a few squeals from the kudu, before it was quickly suffocated by the cheetah. The actual chase was over in a flash and left us completely stunned and speechless! Not having seen the cheetah before the hunt had started, we were totally unprepared and didn’t get any pictures of the hunt itself. 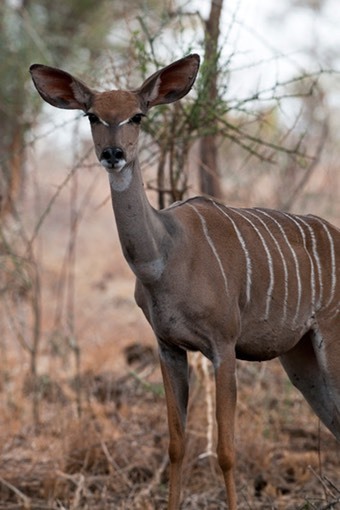 We were wondering if our approach had nearly ruined the cheetah’s hunt, but it probably actually helped it by distracting the kudus. 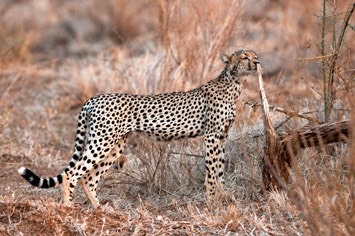 Anyway, it turned out to be a successful hunt, but the cheetah was worried as her prey was lying close to dense bush. She tried to drag the kudu into more open ground but was so exhausted that she didn’t manage to do so, and in the end she just walked off. We waited for a bit as we would have liked to watch her feeding, but in order not disturb her, we moved on. 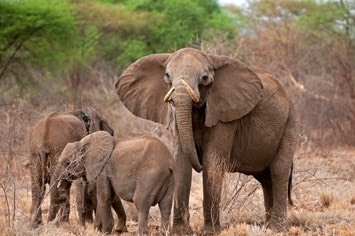 We drove along both banks of a small stream and first came across a herd of six bull elephants, then a family of four and another one of five. 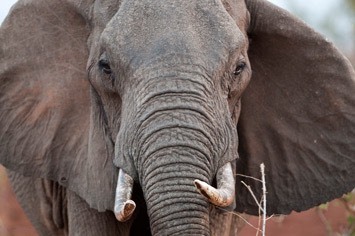 The matriarch of the last group obviously disagreed with our presence near her family. 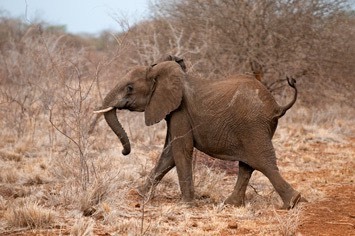 She walked towards us determinedly with her head high and her ears out and, when we drove off in order to give her space, she made a little mock charge and let out a big trumpet call, which roughly translates to “F*** off!”. 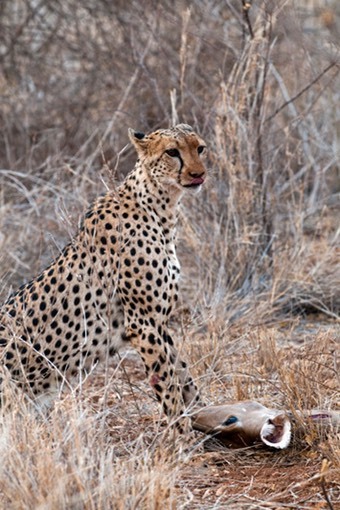 We decided to check on the cheetah kill before returning to camp and when we arrived at the bush in question the kill had gone! 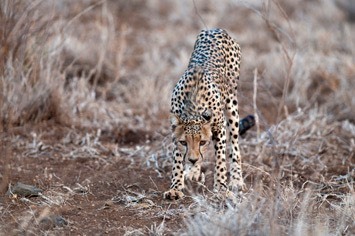 Drag marks led across the track and we could see the carcass and a happy cheetah out in the open. 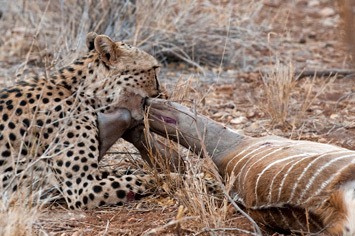 After recovering a bit, she had obviously managed to move the dead kudu and she had already eaten quite a bit of it. Good for her! Now a little rest was in order. 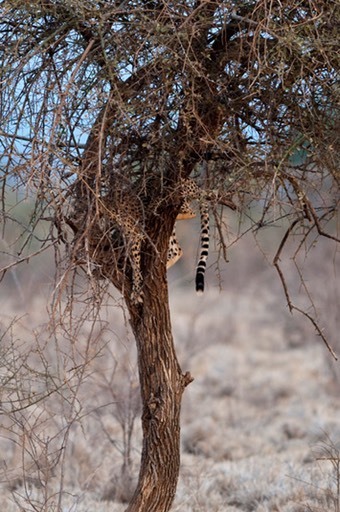 It was a shame to have missed a great photo opportunity, but we felt it was better to have left the cheetah to herself. That way the kill was not in vain and who knows what might have happened had we hung around. This game drive certainly made up for the one from this morning. 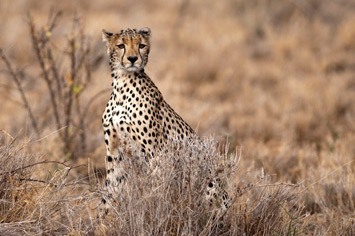 We had also seen a cheetah disappear in the bushes in the morning, so we had three cheetah sightings that we didn’t have to share with anybody in three days! 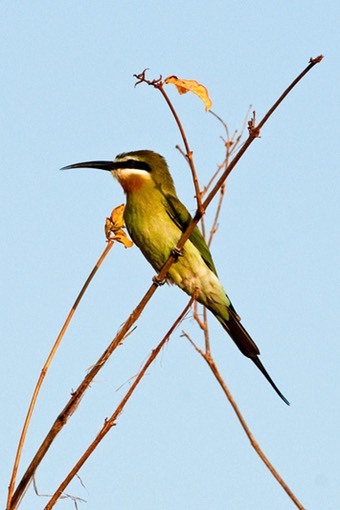 Two of these sightings were truly amazing and memorable. 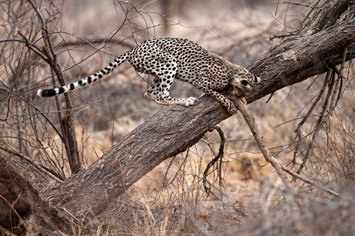 Now we just have to find a leopard, but maybe we’ll have more luck in Samburu. 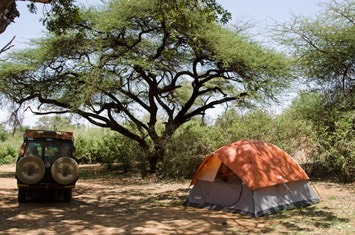 At night, we could hear at least three lions roaring outside our tents again. 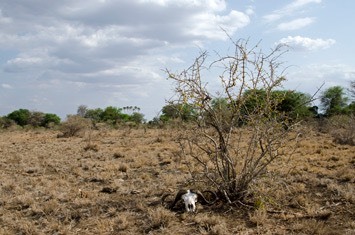 After seeing what looked suspiciously like a poacher, not to mention the Somali herders and their many goats, we didn’t feel quite so secure in Meru any longer. 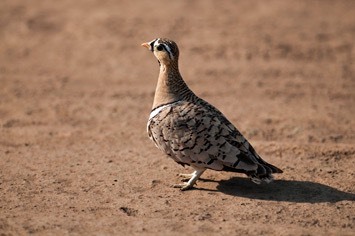 Obviously, it has great wildlife potential, but, due to it’s extreme dryness, we felt we had seen enough for this trip and decided to move on earlier than planned. 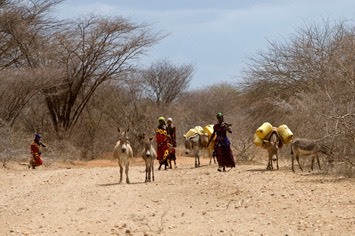 It was obvious that Meru still had its problems, especially during this time of drought. 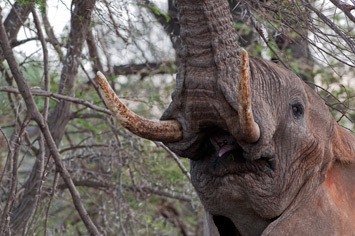 It’s only been restocked with animals in recent years after most of them had been poached and it was obvious that they were still extremely nervous of humans, especially the elephants. They would either run and hide or start threatening cars with heads held high and ears out. It was very sad to see. It was also a bit of a shame that the current drought seemed to result in goats and other domestic animals being “tolerated” in parks where they shouldn’t be. Obviously, it was difficult for these people to find food for their animals, but we felt that letting them browse in National Parks was a slippery road towards disaster. 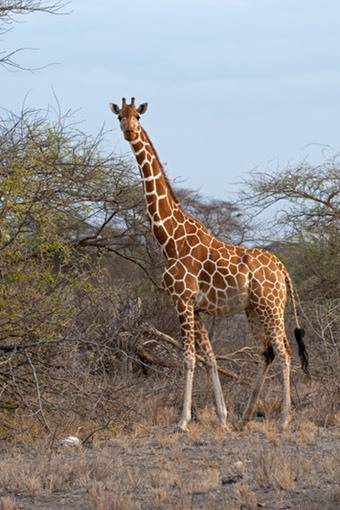 We could hear a few distant lion roars in the morning, but at first light we were visited by a giraffe, a buffalo, a warthog, impalas and cheeky vervet monkeys. The Bwatherongi campsite is truly in the middle of the park, and, as there are no fences, animals can wander around at will. It is a great place to camp and a good base to explore the park. 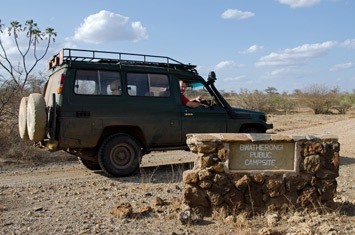 However, after breakfast we packed up camp and gave the wife of the campsite’s caretaker a lift to the Murera gate. 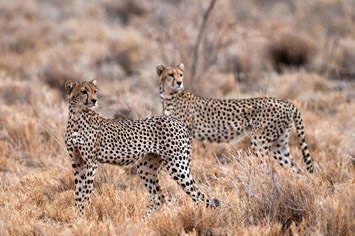 We checked out yesterday’s cheetah kill, but there was very little left and nobody to be seen nearby. 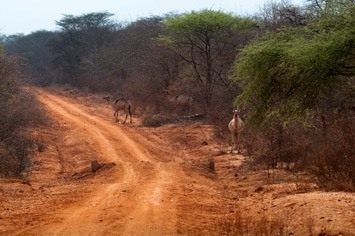 On the way we saw lots of ostriches, some oryx and a lone Grevy’s zebra. At the gate we met the rather chaotic KWS ranger again. Fortunately, there was a very capable young lady there, too, and, thanks to her help and mathematical skills, we were on our way before 9:00. The drive was uneventful, but it was grey and drizzling all the way to Meru town. We passed lots of Miraa (khat) plantations on the way. In Meru we pulled into the big Nakumatt supermarket to replenish our supplies. There we came across a truckload of Germans, who didn’t seem to think it in the least bit odd that Maren spoke to them in German in the middle of Kenya! They were travelling in one of the ghastly “Rotels”, a big truck in which you ride and sleep in tiny coffin-like compartments. 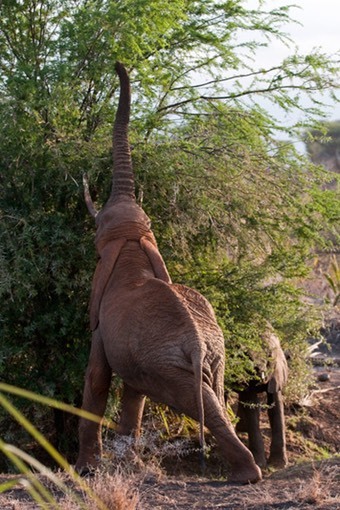 As they were going to Samburu as well, we tried to get a head start. 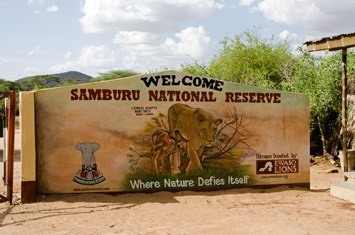 As we headed towards Samburu the skies cleared and it turned sunny and warm. Thanks to the new Chinese road, the drive didn’t take long at all, but approaching Samburu has also lost some of its adventurous character! 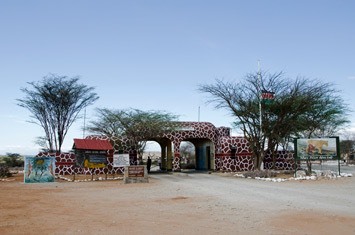 We were shocked at the entrance and camping fees, which total 100 US dollars per person per night. We had read about price rises, but this was twice as much as we paid three years ago! Maren cheekily asked if there was a discount for staying extra long, and it actually worked! We got one day each for free and the car for half price! Although it was still very expensive, our flattery saved us a little bit of money. On the way to the public campsite we already saw plenty of elephants and we drove right up to one group without them being bothered at all. 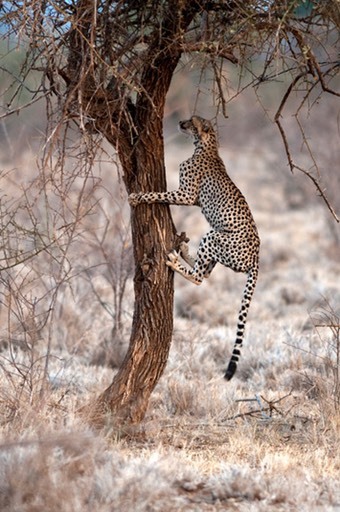 What a change from the nervous elephants of Meru! 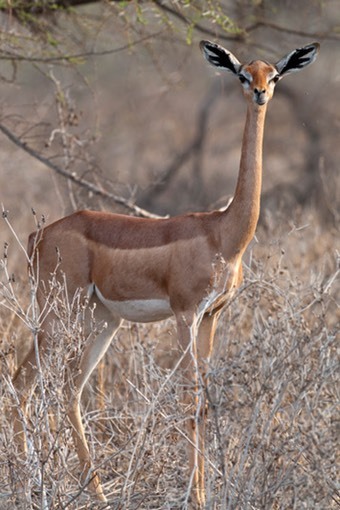 And there were reticulated giraffe, impala, gerenuk, oryx, warthog, dik-dik and a ground squirrel. The campsite we had used last time was already occupied, so we chose the Butterfly campsite, also on the riverbank right at the far end of the designated camping area. We couldn’t put our tent up in the first spot we chose, as it was very windy, but we arranged our camp in such a way that it would deter other people from sharing our own private little glade, shaded by tall trees. 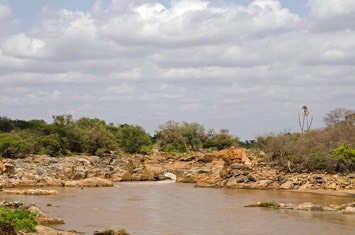 The Ewaso Ngiro (“brown water”) river was much fuller than we had seen it before and it was flowing much faster. 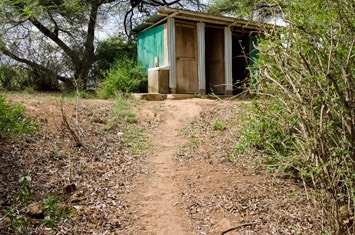 After rebuilding the campsite after the severe floods of 2010, all toilets are now of the “hole in the ground” type and showers are just a pipe coming from the ceiling of the little shower stalls. But at least we got a good spot for ourselves, although we ended up sharing the showers and toilets with a truckload of campers from next door. Getting a man to scare the baboons away proved rather difficult, as prices for the “monkey men” have skyrocketed along with the park entrance fees! Although Charles had told us privately that we definitely had to get one and he did not want to stay in the camp alone, he pretended he could get along by himself perfectly well. That put all the cocky monkey men off and in the end we agreed a reasonable price with a nice young lad, who helped us unpack all the stuff from the car and set up camp as well.